Perfect for our router table tops! Weighs 32 lbs. List $160. The adjustable Roller Stand (shown here with our Router Table Top), can be easily used with a Chop Saw, Drill Press, Planer, and other workshop tools. Click tab above to view video. Compatibility Note: The Adjustable Roller Support Stand is designed to be universal. However, you will likely have to drill your own mounting holes in your router table to attach it. 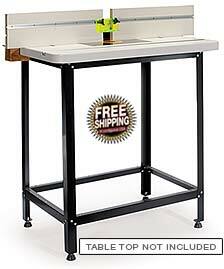 I purchased the Roller Extension Support Table along with the Router Table with an Aluminum Fence. The installation of the roller table stand married to the Router Table W/Fence was self explanatory. The roller extensions work well with long stock. I could easily see this working with a planer. The adjustments are easily set, and for those A-Types out there, place a level on your stock to adjust the height to the correct setting for the even cut. Always do a dry run prior to the cut. Measure five times for one cut and a great many miss cuts will be avoided. With the router table being as heavily built as it is I believe it will last for years. Maintenance on the 12" rollers will be easy enough with some occasional steel wool. I really enjoy the table having the extensions built into the framing of the stand. I believe the best application for the roller stand would be with a planer, he said he most likely will purchase. Thank YOU MLCS with this wonderful product. I just assembled this stand for my Dewalt Planer. I kept thinking at least one of the bolt holes would be in the wrong place or not straight (as is usual) but everything went together perfectly. The only thing I changed was to enlarge the holes slightly so I could bolt the base to the 1 1/2" plywood top I made. I didn't feel comfortable using just the screws that were provided. This heavy duty should last for many years. I don’t normally do reviews but in this case I made an exception. The stand arrived when it was supposed to and when I opened the box I was really surprised with what I found. The fit & finish was much better than I expected. The hardware was better than what I have seen lately. The design of the legs and the rubber feet was really ingenious. I have never seen rubber feet like these. The angle was perfect for giving the stand a high degree of stability and it is rock solid. The only thing I could suggest as an improvement is to make the unit 3-4 inches wider. Another super product from MLCS. Packing was OK. All parts were there, in fact the table was partially assembled. Everything fit together nicely. The table top can be made of your choice or a router table top. Very sturdy and the adjustable roller stands are fantastic. I will be purchasing another very soon!!! 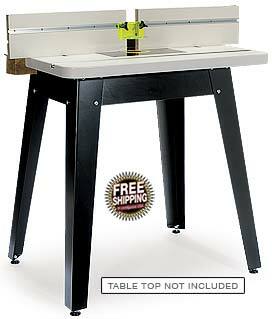 Add MLCS Router Table Top, Miter Saw, Planer, Scroll Saw, or any benchtop tool. Splayed legs with adjustable rubber feet ensure stability and reduce tool vibration. Stand measures 32" tall. Top of stand measures 24" x 16-1/2" and the footprint is 32" x 24". Compatibility Note: The "Heavy Duty" Tool Stand is designed to be universal. However, you will likely have to drill your own mounting holes in your router table to attach it. After purchasing the standard router table stand ($70 retail) and posting a negative review of if, MLCS contacted me and offered to upgrade the stand to the the heavy duty model for the incremental difference in cost. Great customer service..thanks Chris. This model is exactly what I needed as it is rock solid and doesn't "bend in the wind" when working with long heavy stock. The "feet" mounting tabs are welded to the legs so there is no chance of bending. I transfered the wheels on the old table to this one and "what a difference"...This stand with definitly do the job and is more than worth the difference in price. PS: the old table is being used for a paint stand...much more suited to its stability. Just add MLCS Router Table Top or custom top and you have the perfect power tool stand for your Router, Planer, Bandsaw, Mini lathe, Portable drill press, or Grinder. This frame is 27" x 19" x 33". Weighs 12 lbs. Compatibility Note: Our standard Router Table Top and Fence (RT1 and RT2) has properly positioned threaded inserts for mounting to this stand. For other router tables, you will likely have to drill your own mounting holes in your router table to attach them.